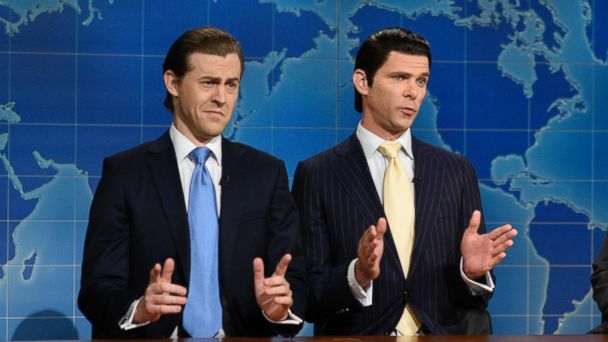 The special counsel paid a special visit to the president's sons on this week's episode of "Saturday Night Live." Eric Trump, played with usual stupid brilliance by Alex Moffat, was being tucked into bed by Mikey Day's Donald Trump Jr. when he started to have some fears about he and his brother's future. "There's no boogeyman in your closet," Trump Jr. said. "Have you been watching the news again?" Day's Trump Jr. decided to read his younger brother a bedtime story to help calm him down. Eric struggled a bit with the meaning of words in "Twas the Night Before Christmas" (starting with the very first word). But it was a large creaking noise that brought out the real boogeyman. "That's the cheap steel dad uses to build his towers," Trump Jr. said, walking over to open the closet. "See, nothing in the closet?" Of course, as he opened the door, Robert Mueller -- played as usual by Robert De Niro -- was standing inside. "Robert Mueller is in there!" Eric exclaimed. "Eric, nobody likes a fibber," Trump Jr. said, before leaving to take a phone call from his lawyer. Mueller sat down with Eric to say, "No matter what happens, America is gonna be just fine," because of the good people in it. "Good people like my dad?" he asked. "Let's put a pin in that," Mueller responded. "Mr. Mueller, people say you're the worst thing that's ever happened to my dad," Eric said. De Niro then delivered the line that got the biggest applause of the sketch: "No, getting elected president is the worst thing to ever happen to your dad."